There are many reasons you might need a winch out service. Luckily, New Braunfels Towing Service is always here to offer a helping hand. Whether you’re stuck in sand or mud, or your vehicle has somehow skidded off road and can’t now be driven, we can help. It’s good to know that we have the equipment to cope with even larger vehicles. It’s always a pleasure to serve - give us a call today, our helpful team is here for you. Winching - or a winch out service, is used for a vehicle which has become stuck for some reason, and needs help to be returned back to the road, or to an area where conditions are better. Typical situations might include a car that has become stuck in sandy conditions, or mud, or which has gone a small way off road and can not now get back to the paved surface without help. Typically winching is used to return a car to a position where it can be driven again - rather than a recovery service which is needed if the car has suffered bad damage and needs repairs before being used again. Can I get my car out without a winch out? 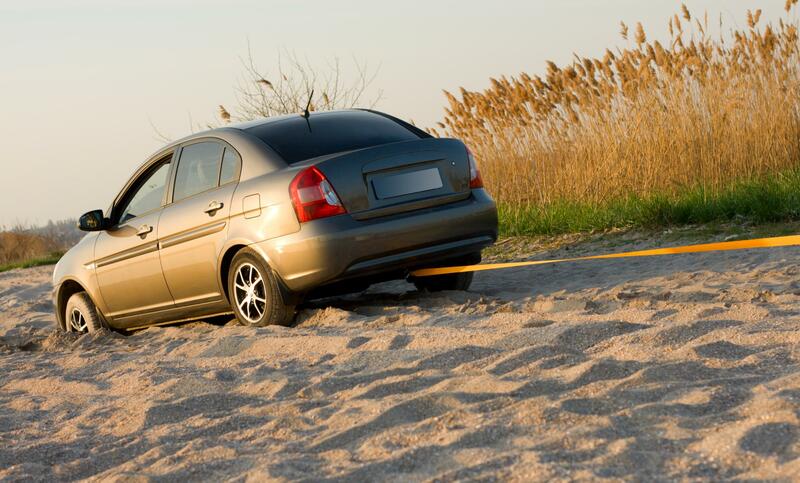 If your car is off road, or so deeply stuck in mud or sand that it’s impossible to move on your own, then a winch out might be your only available option. However, if you’re stuck - say in mud - and think you might be able to free your car yourself, here’s what to do. Choose a low gear, and try to gently edge your car forward and backward. It helps if you can find anything to create traction - small branches or rubber mats can be put under the tires for example. Don’t spin the wheels, as this will only make matters worse. If after all that your vehicle is still going nowhere, give us a call for some professional help. There are a few things our call operator will need to know, to assess the situation and make sure we dispatch the right team to help you. Our team will ask for information about where you are stuck, including an address if possible. We will also need to know where you are if you have had to leave the vehicle to call us. It’s helpful to know about how far your vehicle is from a paved surface, and if any tires have stayed on the road. Giving us an idea of what’s happened and what the conditions are like where you are is also helpful. We can provide winching services for anywhere in the New Braunfels, Texas area. Whether you have a small car or a larger commercial vehicle, we have the right equipment to get your out of trouble. In most cases, a winch out is needed after an incident or accident, and you’ll be in a hurry to get moving. It’s best therefore you give us a call on the number available on this website. We will do everything we can to get to you as soon as possible, so you’re not waiting for any longer than you absolutely have to.